Play the brand new Kingdom Rush 2 game and defend your kingdom against the rush of orcs, trolls, evil wizards and other nasty creatures. Beat all the enemies and earn gold by killing them. 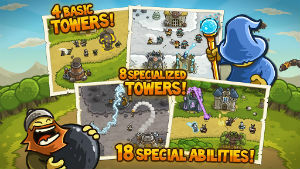 Kingdom Rush 2 is a tower defense game with 18 levels and 48 different types of monsters. In this awesome strategy game, you have to build towers along the road and defend your kingdom. Be a hero of your land and lead your brave squad. Enjoy the Kingdom Rush 2 game!